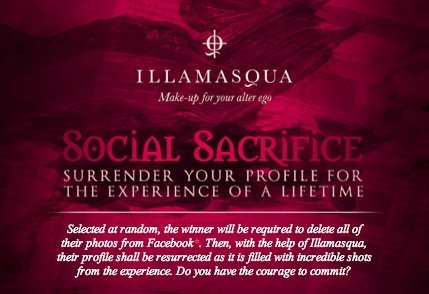 2 tickets to the launch of Illamasqua’s first fragrance in association with The Last Tuesday Society on Saturday 29th October 2011. 2 tickets to a fashion show at London Fashion Week with backstage access and a chance to cover the event for Illamasqua’s blog. 2 tickets to attend a Night Time Diva course at Illamasqua’s School of Make-Up Art. Star in your own beauty photo shoot at Illamasqua’s School of Make-Up Art. A guided tour around Vicky McClure’s latest film set by the BAFTA winning actress herself. Supper and a screening at BAFTA with Spob, head make-up & hair artist on ‘Born Again’. 90-minute pampering package at award winning central London salon ‘Inanch London’. A Personal Shopping experience, accompanied by your very own stylist with £500 spending money. A night on the town with the Illamasqua Art Team. £500 of Illamasqua products of your choice. (subject to availability). All travel costs within the UK and accommodation for one night for you and a friend at the stylish Sanctum Hotel Soho. The Art of Self-Indulgence course at Illamasqua’s School of Make-Up Art. A private party for you and a group of 6-12 friends! An amazing 2 hour evening event hosted by an Illamasqua Professional Make-Up Artist who will design a bespoke course to excite and delight your group. £500 of Illamasqua products of your choice. 10 x Illamasqua goodie bags worth £100. Will you surrender your profile?